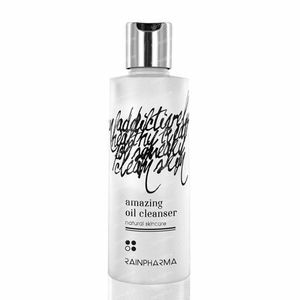 Rainpharma Amazing Oil Cleanser 200 ml order online. An oil-based cleanser removes waterproof make-up, excess sebum and airborne impurities in one easy step. Oils of sweet almond, avocado and jojoba cleanse, aloe vera nourishes and calms and lemon verbena refreshes and relaxes the skin. Massage the gel onto dry skin, add water to transform into a cleansing milk and massage further. Rinse well. Follow with Dedicated Face Wash to remove the last traces of watersoluble dirt. This cleanser is 99.65% natural and 100% safe for the environment and your skin. Free from preservatives. Use our personal care products according to the alphabet: a-b-c-d-e-f. Up to six steps. 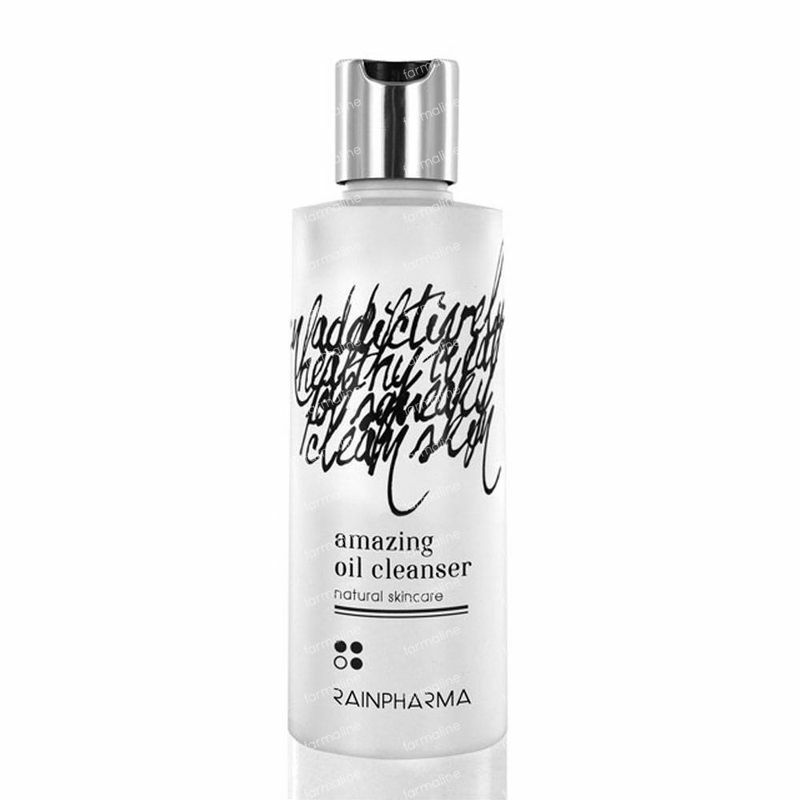 With Amazing Oil Cleanser you’ve got a fantastic product from RainPharma’s natural skin programme in your hands. Give the other five steps (from A to F) a place in your bathroom and use them each day. Our high-quality plant formulas allow you to enjoy healthy, balanced skin. RainPharma face products contain no cheap fillers: they’re bursting full of quality, active ingredients. So you can use them very sparingly. Water is not a key ingredient in this formula, which is highly unique and rare. 99,65% of all ingredients are of natural origin and plant-based. No nasties. Double-clean your face, twice daily – that’s our secret. Start with the oil-based cleanser, follow with the water-based one. The result? Skin that is perfectly lean, but does not feel dry. GLYCERIN, CAPRYLIC/CAPRIC TRIGLYCERIDE, PRUNUS AMYGDALUS DULCIS OIL, LIPPIA CITRIODORA LEAF WATER, PERSEA GRATISSIMA OIL, ALOE BARBADENSIS LEAF OIL, SIMMONDSIA CHINENSIS OIL, SUCROSE PALMITATE, METHYLPROPANEDIOL/CAPRYLYL GLYCOL/PHENYLPROPANOL, LAVANDULA ANGUSTIFOLIA HERB OIL, LIMONENE*, TOCOPHEROL, CITRUS SINENSIS PEEL OIL, CITRUS LIMON PEEL OIL, ROSMARINUS OFFICINALIS FLOWER OIL, LINALOOL, SANTALUM ALBUM OIL, BOSWELLIA CARTERII OIL, SALVIA SCLAREA FLOWER OIL, POGOSTEMON CABLIN LEAF OIL, CEDRUS ATLANTICA BARK OIL, EUCALYPTUS GLOBULUS LEAF OIL.